Elsewhere in this weblog I’ve written about how much I admired, and continue to admire, R. Buckminster Fuller. Though radically different from each other, I hold him and Robert Anton Wilson in equally high regard. I like it. When will I get it? Sometime next year probably. After seeing someone else with a platonic solid tattoo, I’ve decided to remove the shading from the icosahedron, leaving just the edges and vertices. It should be much easier to tattoo and it should be much more legible. 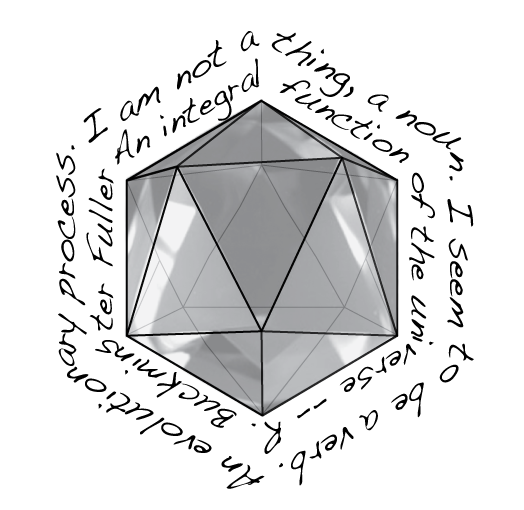 I’m still not sure about the font and the spacing between the icosahedron and the text. Today I spent all day at TEDx Boston. My brain is full of intriguing ideas; some I agree with, some of which I’m not too sure of, all of which have me thinking. Thinking more than usual. If you know me, that’s a lot of thinking. What is TEDx Boston? For that matter, what is TED? Well, you could just follow the link, but I’ll tell you. TED is a small nonprofit devoted to Ideas Worth Spreading. TED originally stood for Technology, Entertainment, Design, but the conference has grown in scope far beyond that. What then is TEDx? TEDxis a new program that enables local communities such as schools, businesses, libraries, neighborhoods or just groups of friends to organize, design and host their own independent, TED-like events. If you know me, you know that I’m a mind mapper. For me it is the fastest way for me to record notes in high density, along with recording connections amongst and between ideas. Plus, the physical act of diagramming improves my recall. Re-drawing my notes improves my recall even more, in addition to allowing me to tease out even more connections / references / reflections / refractions / contradictions in the idea space presented and represented. That’s why I’m not going to say anything more about TEDx Boston until this coming Sunday. The mind maps I generated are so huge, that it will take that long for me to straighten them out. They’ll be an integral part of my next post. Until then, Keep Thinking. Share those Ideas. Once upon a time, I considered myself a failure in life. I was stuck in a dead end job at U.S.C. (Southern California for my East coast readers), I was past 30 and I hadn’t finished an undergraduate degree. I was a major underachiever. 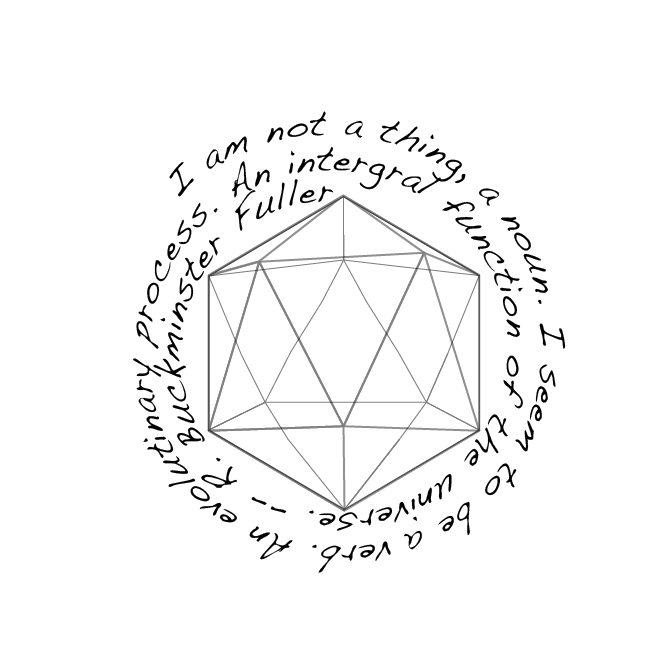 I don’t remember how I ended up looking up R. Buckminster Fuller in the Arts & Architecture library, but I did. I don’t know if it was a result of reading through the architecture magazines, but I ended up charging through the Bucky collection in the library. The man considered himself a failure at 32 and was prepared to throw himself into the chilly waters of lake Michigan. He didn’t. He perservered. He found a purpose for his life, and succeeded. I took a deep look at his life, devoured his books like a starving man in a bakery, looked at my own life, and decided that things weren’t quite so bad. Long story short – back to college, then grad school. Life was fun again.